Stronghold: Crusader II stays true to the original 2002 game without feeling dated, and brings back a brand of strategy games we don’t see that often these days. Read on to find out why we liked Firefly Studios’ reboot of their signature franchise. For those not familiar with the Stronghold games, it’s still no surprise that this game takes place during the Crusades. Those familiar with the original games in the series will also know that a careful balance between your economy, your warfare tactics and the way you govern your people is the key to success. It was an excellent formula for the original games and Firefly Studios has kept that entirely intact. The depth of the gameplay also means that slight changes in your economy can sway the tide of battle in your favor down the road – or against it. This is part of the charm of the game, but also somewhat daunting to those who are Stronghold novices. It’s this group of gamers that will profit hugely from Crusader II’s tutorial missions, in which all the basic gameplay fundamentals are explained in a way that also draws you into the game’s campaign modes by providing a backdrop story. After the tutorial, the story takes a back seat and grand skirmish battles take center stage. 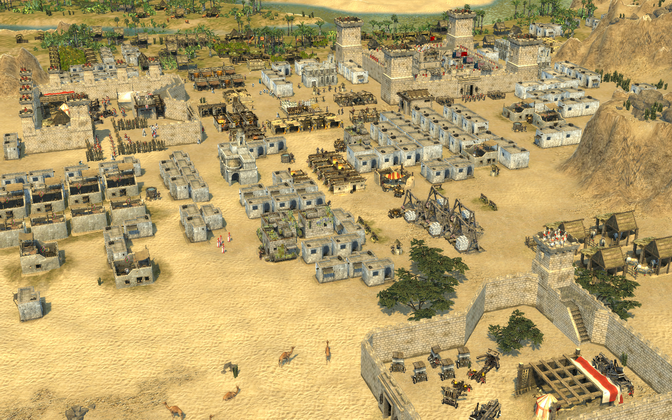 Resource management becomes crucial, and balancing your troops can be the key to success. 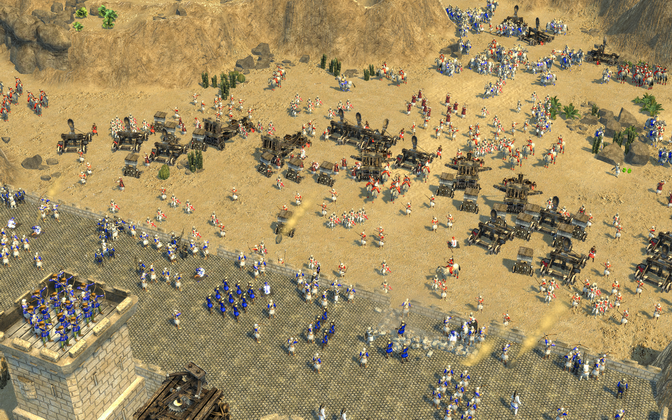 Having a lot of heavy siege weapons might mean you’ll eventually tear down the walls of the enemy’s keep, but you might still lose the battle if you are lacking in ground troops. Another tactic could be to spread disease and starve out the enemy, a process that usually starts by using your catapults to launch dead cows over the castle walls. If you prefer a quicker and more daring tactic, you can use the same catapult to try and take down those same walls before storming the fort. However, you’ll also be on the other side of the battle and creating and maintaining your defenses is just as important as taking down those built by others. Stronghold: Crusader II is far from being a casual game, and the average battle might take you more than an hour to complete – or even several hours, during which the momentum will often shift from one army to the other. You’ll also find yourself drifting off into defeat, second-guessing your earlier decisions and trying new tactics upon loading that savegame you were holding on to. There will be moments of frustration, but also moments of great satisfaction, when you finally outsmart your adversary and realize you’ll be bringing him to his knees – even before he realizes it. A lot of these elements can also be found in the original game, but Firefly Studios has updated their game in several ways. Most strikingly, they are now using a 3D engine even though they are keeping the original look of the game intact. This is done by implementing grids in a 3D world, which creates a 2.5D feel that will feel familiar to fans of the original. Another major change comes in the shape of special abilities for more units – something which was fairly rare in the original game but adds even more depth to an already strategically rich game. If we’re to fault the game for anything, it’s perhaps that it relies too heavily on its excellent gameplay mechanics. While the game is in 3D now, its looks won’t blow you away if you’re used to the likes of Company of Heroes 2. The same could be said for the campaign structure – which feels more like a sequence of battle scenarios and less like an epic storyline that takes place during the Crusades. However, if you’re looking for a challenging strategy game and don’t mind an experience that favors careful planning over all-out warfare, this is just the game for you.